It’s been a long time since we had one of these, so let’s recap exactly what we aim to accomplish. Character Autopsy as a term means a deeper look into how a character is portrayed, digging into their subtext and motivations and trying to figure out what makes them tick. Thus far, the articles in this series have focused on characters from The Clone Wars and were focused on their portrayal within the show’s context to form a basis for how they could be portrayed in future media. 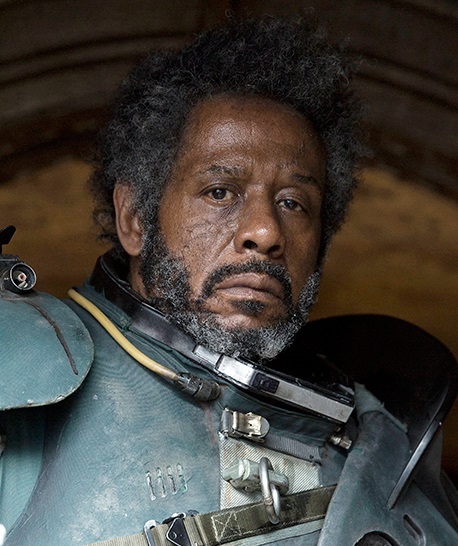 So let’s talk about Saw Gerrera. Saw appeared in four episodes of TCW, through one extended season five arc that took place on the classic Expanded Universe world of Onderon. It was just announced that he would be making the jump from the small screen to the big one as portrayed in Rogue One by the esteemed Forest Whitaker. But who is he? What makes him tick? And why would he stumble out of the shadows asking prospective rebel agents about what they will become if they continue to fight the Empire? We first see Saw as the self-appointed leader of the resistance against the Separatists on his world, along with his sister Steela and Lux Bonteri, the recurring-not-love-interest to Ahsoka Tano. Saw is a reckless and straightforward sort of person, focused on fighting the enemy and relying on Bonteri and his sister to be the diplomat and voice of reason respectively. He has the infectious enthusiasm to lead, but lacks the tact to soften the blows he strikes for the cause. A defining trait for Saw throughout his portrayal is a strong sense of patriotism, and the desire for his planet and his people to be free to decide their own rule. He borrows much of this from the Onderonian Beast Riders of the Tales of the Jedi comics, a fierce and independent people who fought to be free from their own tyrannical rulers. Saw is blunt and straightforward with those around him, disparaging where he sees weakness and supporting where he sees strength, especially in Lux Bonteri, a senator’s son with little combat experience. Once their group moves from being trained under the Jedi to acting more openly, Saw leads the sort of reckless daylight attacks that have his group of rebels flush with success. They strike fear in the hearts of the populace not as a group of freedom fighters, but as terrorists. Their efforts lead to an escalation of fighting within the capital of Iziz until the usurper king they have been trying to depose is all but ousted by his own Separatist allies as they lock the planet down even more tightly. It’s a theme that’s common through other stories about rising rebel cells. The parallels between Saw and the Onderonians and a group like Cham Syndulla and his Ryloth resistance, or Kanan, Ezra and the rest of the Lothal rebels, is very likely intentional. Though they are fighting against the Separatists and not the Empire, Saw’s group is still up against a largely implacable foe with nearly unlimited resources, and every victory only brings further destruction and pain, further extension of the fighting, further pain for the people caught in the middle. The main difference is, while Saw’s group has the Republic on their side, later rebels would largely fight alone. As their operation expands, Saw cedes the leadership of their group to his sister Steela and her greater grasp of diplomacy and the thoughtfulness to soften their war. But when the king they are trying to reinstall on the throne is scheduled for execution, he pulls a Luke Skywalker and runs off to rescue him without planning ahead, leading to his capture. His karmic punishment for his brashness, torture at Separatist hands, also inadvertently leads to their movement’s ranks swelling as his stubborn refusal to break inspires the head of royal security to defect along with all of his men, largely turning the public of Iziz against the Separatists. Of course, it all comes crashing down on Saw as the fight wears on to its conclusion. After abandoning the capital in an effort to limit civilian casualties, a decision that Saw was against, the Separatists bring the full force of their armies against the rebels for one last battle and, in the ensuing melee, Steela Gerrera is killed. Without his sister to support him Saw is left a shell of his former self, all of the hollowed-out frustration of war filling him with only the barest temperance of victory now that Onderon is free. Without his sister, and with Lux Bonteri off to the Senate to represent their world and Ahsoka back to Coruscant and the Jedi, Saw is left alone to stew in his sorrow. What happens to Saw when the Republic turns to the Empire and Onderon finds itself under the boot of another sort of tyrant is largely a mystery. The little we do know is that Saw had put his blaster down for a year at most before the change occurred and he had to take it up again. What little was left of the good man who had led the charge against Separatist tyranny was whittled down as the years and fighting dragged on, until his name became synonymous with Rebel terrorist tactics long after the Empire had fallen. Saw is one of the best candidates for a Clone Wars-era character to be pulled forward and used again in the original trilogy era, precisely because of the superb groundwork laid out for him already. What we see of him in TCW is the background, a story of a man who pushes himself to the edge and beyond in the name of his people and their freedom. Whatever happens to him in Rogue One has its groundwork already laid out, and there is plenty of potential to see him show up in other stories in the future. Like Star Wars Rebels, perhaps. His lines in the trailer, the questions he asks, hint at what it has cost him to run his campaign over many long years. By the time of Rogue One, Saw has spent almost his entire adult life fighting the same battle against different foes, with the few people to support him and who care about him long dead or disappeared into the depths of space. He has been left a bitter, broken shell of the man he once was, with only his raw, stubborn determination keeping him going. What he is asking of Jyn is whether she is ready to take her story along the same path he once walked, whether she’s willing to endure the true cost of war.